In this sequel for 8 – 12 year olds, author, HJ Harper has created a fantastic, almost Dickensian world, melding genres of Steampunk, Western and Detective Novel with a pinch of James Bond thrown in. It’s a combination to intrigue most readers. The young protagonist, George, with the aid of his Cryptographer’s Compendium (his code-breaking book) and his partner, Imp Spektor, have to save the mysterious metropolis of Little Obscurity. They team up with adventurer, Lord Periwinkle Tinkerton, who travels with his scribing assistant, Lexica Quill, in his mechanical mammothmobile. Together they battle mechanical bulls and icebergs of garbage; they ride on a giant grey rat called Bubonic through the sewerage dungeons and joust giant lice. George uses all the tools of the trade in his quest to eradicate the Mechanomancers. He has Antigravity Gauntlets and Eyeopener Goggles. There are skypirates and skydragons. The adventure twists and turns as each chapter ends on a hook. The reader rollicks along with George as he comes across many codes that he has to crack. This is a strength of the book, as young readers will pit their wits against George, in the quest to work out the clues and eliminate the enemy. There is clever wordplay throughout that keeps you chuckling. There are clichés and puns (the Clockness Monster, Joust in Time). The use of first person includes lots of internal dialogue, so you know what George Feather is thinking. All is wonderfully illustrated in Nahum Ziersch’s stylised black and white panels that depict characters and scenes along the way. Twist follows twist towards the last third of the book. You don’t know the goodies from the baddies as you weave in and out of the story. In the end, it’s down to the power of the pen … and the ability to decipher codes. This entry was posted in Book Reviews on August 29, 2013 by marian. Tuscany is like a Renaissance painting; its beauty and mystique enthral those who step inside its frame. Take your pick, each city has its own story: Florence, Pisa, Pienza, Lucca, Siena. And that’s where this story lays its roots, in Siena, the bejewelled brooch that clasps the tapestry of Tuscany. 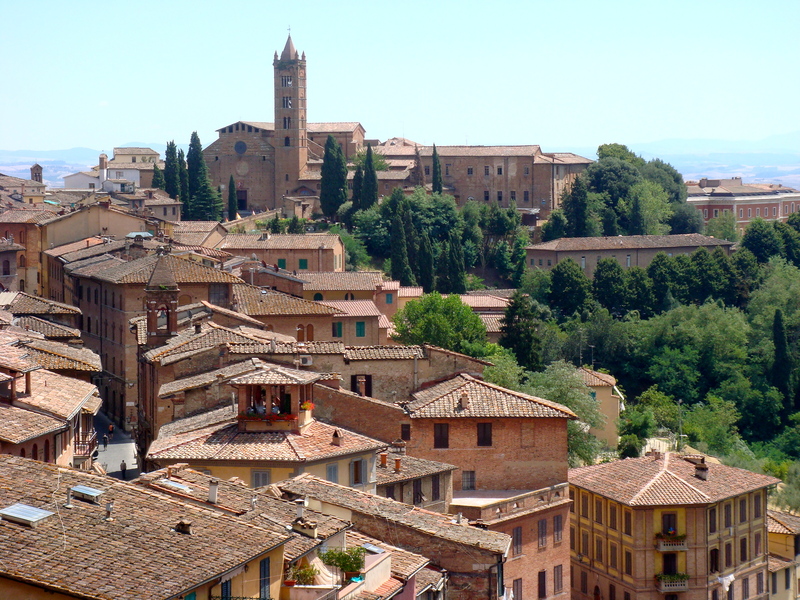 There are many things to love about Siena. Further down the palio track I’ll write more about its medieval charisma, but for this story, Siena’s black humour is my focus. Had I been squeamish, I might have continued walking through the gloomy Vicolo del Bargello and into the bustle of Siena’s enchanting campo to enjoy a coffee in the sunlight. But the combination of the medieval laneway, the meaning of bargello (a zigzag stitch resembling flames) and the macabre blurb on the poster outside the Museo della Tortura (Museum of Torture) “these instruments show just how much human fantasy knew no limits …” reels me in, hook, line and tongue cutter. A skeletal hand reaches out from the Highwayman’s Coffin and points to the museum’s first dark chamber. This weathered wretch has been hanging around in his iron cage for centuries. He’s been swaying in the breeze outside town halls, ducal palaces and cathedrals, through winter winds and summer storms until his bones have fallen apart. Not too far inside the first cold stone and brick cavern, reality sobers me to the horrors of human cruelty. It puzzles me to think of the hours of creativity that went into designing and decorating these devices of humiliation, oppression and torture. Take the iron sandals with the bell at the toe that was fitted to clumsy servants. Every time the bell rang, the master tightened the heel. 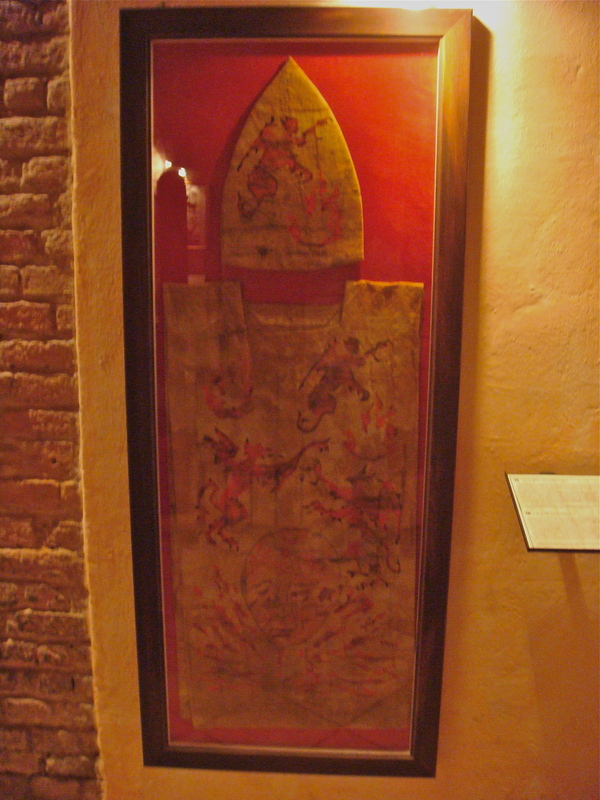 There are many gruesome original and reproduced items on display that reflect the time in history where public hangings and punishments were seen as entertainment. Behind a glass panel I examine a beheader’s sword. It looks like an oversized butter knife. It took a long apprenticeship to become professional beheader. With each victim, the apprentice had three goes to get the decapitation right. Who was going to worry about the occasional severed shoulder, arm or brainpan? No detail is spared of how each instrument worked, which orifice the device was meant for, which limb was dislocated and who was the usual customer. Women were particularly well represented with breast rippers, shrew fiddles, scold bridles, chastity belts and the ornately designed Pear of Anguish, a disturbing device inserted and expanded in the offensive orifice. 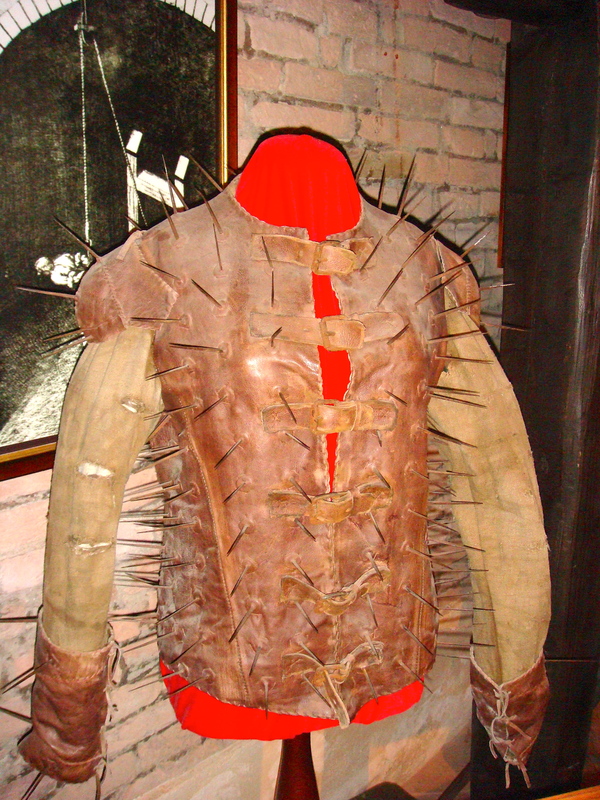 Rioting prisoners would have been well ventilated, as the wardens in those poxy medieval dungeons wore leather jackets pierced with iron spikes in Hannibal Lecter fashion. I’ve spent about an hour examining racks, iron maidens and head crushers that inflicted pain and death on heretics, blasphemers and the promiscuous. You may think that the idea of a visiting a torture museum is no better than attending the public spectacle of torture in the past. Yet, it’s the professional display and insightful (often tongue-in-cheek) explanations that make me question how civilised we are meant to be today. 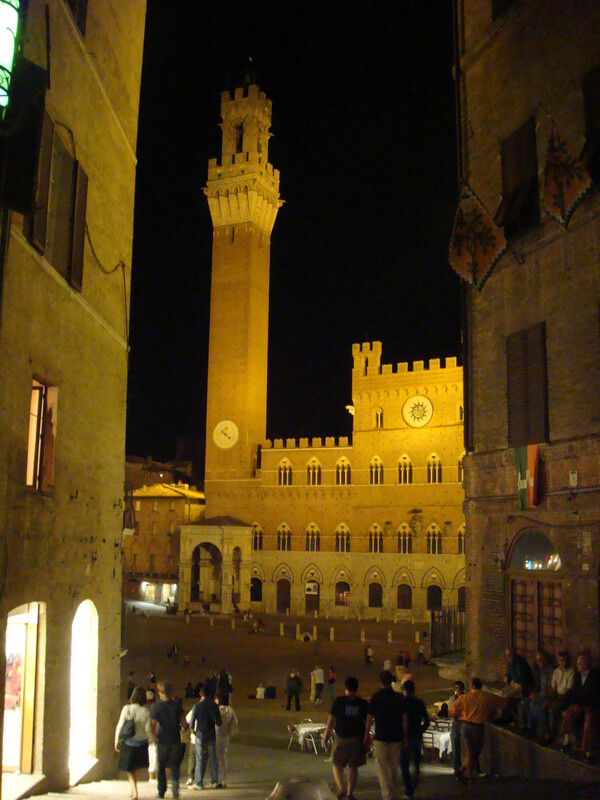 This entry was posted in Travel and tagged Italy, Siena on August 7, 2013 by marian. 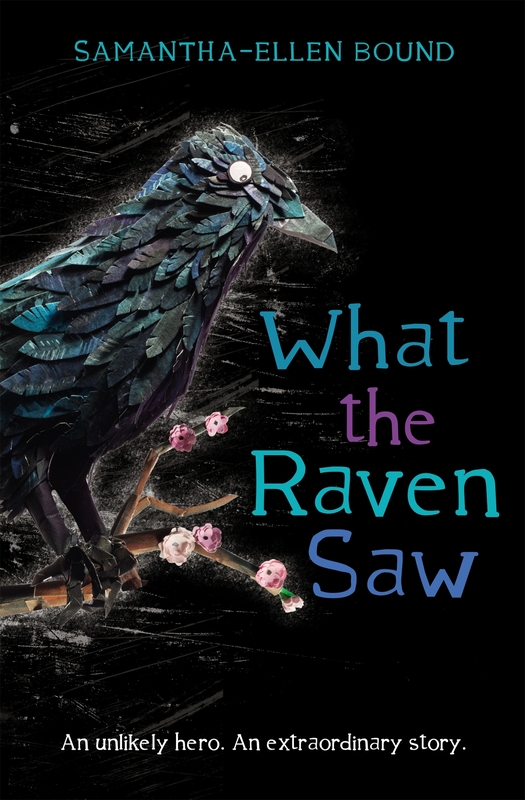 On first sighting the gothic cover of What the Raven Saw I was reminded of Edgar Allan Poe’s equally gothic poem, The Raven, with its dark imagery and philosophical concepts. Readers who love something different, something ethereal, something a little enigmatic, will enjoy this extraordinary and original tale about a raven that lives in the bell tower of Father Cadman’s church. Here, the raven converses with a bookish but inferior pigeon, a flirty weather vane and the many ghosts who inhabit the graveyard. But there are other stories happening around the raven. There’s the child-ghost of Todd, who has just been buried. His sister, Mackenzie, frets that his death is her fault. Somehow the raven finds a way to communicate between the two. There’s the man who the raven sees in the churchyard tree; he is full of despair and ready to jump. The raven ‘dealt out life’s lessons in the branches of a tree’ and saved the man’s life. There’s a lonely scarecrow in a nearby field in need of solace, and a church thief. Both come under the watchful wing and the philosophical wisdom of the raven. The concepts of this book are old, almost fable-like. You learn that beneath the raven’s cool, black feathers, there is a soul both proud and lonely. He loves to live in Father Cadman’s church as it welcomes all creatures. Beauty is found in death, in storms, in tatty old scarecrows, ‘everything from tombs to abandoned wheelbarrows to the spires of the church, (they) had a lightness, a sense of belonging to only themselves’. This is the crux of the story. It’s a book about mythology and symbolism. Its values are those of generosity and kindness and its themes are of loneliness, helping others and dealing with death. It’s about philosophy and finding your voice. Samantha-Ellen Bound has done a fine job in writing such a layered, complex and compelling story that will hold the interest of readers 11+. Next time you see a raven, look it in the eye and wonder what it’s thinking. This entry was posted in Book Reviews on August 1, 2013 by marian.